Blue whales locate prey by relying heavily on memory to return to stable, high-quality foraging sites, which historically have served them well, rather than matching the waves of krill availability in any given year. An estimated 2,500 of the world's 10,000 blue whales spend time in the waters off the West Coast of the Americas and are known as the eastern North Pacific population. The blue whale is the largest known creature to ever inhabit the Earth but up until very recently, almost nothing was known about its mating and migration routes. 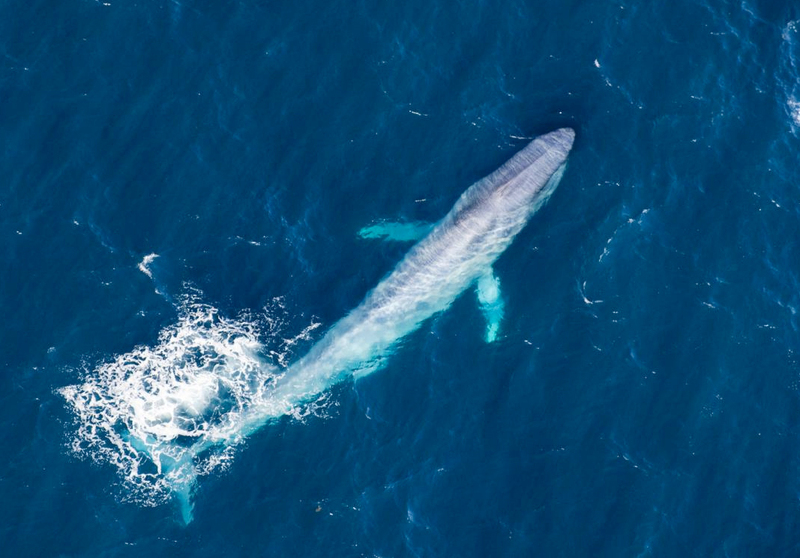 By examining records of both whale migration and oceanic conditions in the California Current Ecosystem researchers found that blue whales almost perfectly match the timing of their migration to the historical average timing of krill production. Many migrant species track waves of high-quality food sources across landscapes. Popular subjects on nature documentaries trekking caribou in the Arctic and wildebeests in the Serengeti, both enhance their survival by carefully adjusting the pace and timing of their migrations to find food as it becomes seasonally available along the way. Blue whales seem to embrace that same strategy. Tracking the timing of food availability along migration routes has been more difficult to identify in marine creatures and have not been extensively explored. By combining 10 years of satellite tracking data on blue whales with simultaneous remotely-sensed oceanographic measurements in the North Pacific, the timing of whale movements was compared to the timing of the spring phytoplankton bloom, which drives a coast-wide wave of krill, the whales' primary prey. These comparisons went to show that both long-term memory and resource tracking play key roles in the long-distance migrations of these mighty creatures. Results also indicate that memory of long-term average conditions may have a previously underappreciated role in driving migratory movements of long-lived species in marine systems. Daniel Palacios, a principal investigator with Oregon State’s Marine Mammal Institute and a co-author on the study.